This is entitled CAS poppies…for those of you who aren’t familiar with the term CAS – it means using a Clean And Simple design. Using a standard A2 card base, I inked up my floral images with several markers in shades of pink and green and lightly spritzed them with water before stamping. Hence the term, spritzed watercoloring. Then a added a few dots of Stickles for a little bling. 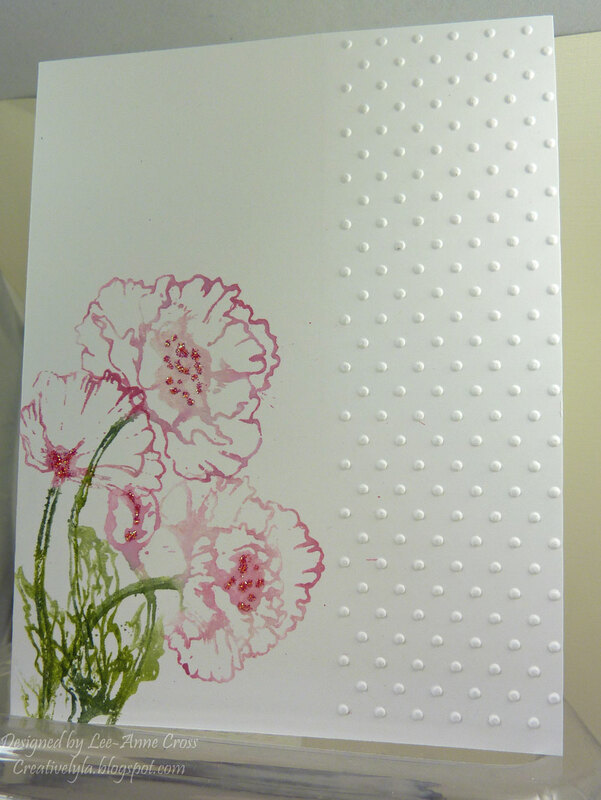 And finally, I used an embossing folder, just along of the edge of the card, for a little texture. A very simple design and very simple to make card…about 10 minutes in total. Sometimes I like to leave a card without a sentiment so that it can be used for many different occasions. This card will work for birthdays, weddings, as a thank you…you name it! This card is so stunning.. I am off to make one…I love poppies and especially a really fast card!